Mary Emma Donaghy - Edmonton's Burial & Cremation Professionals | Trinity Funeral Home Ltd. Surrounded by her loving family, Mary Emma Donaghy (nee Campbell) passed away after a courageous battle with cancer. 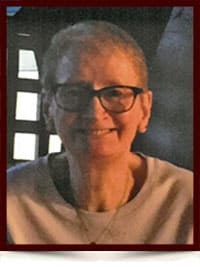 Mary will be sorely missed by her husband Seamus, children Annette and Gary and grandson Oblio; brothers John (Mary), Joe (Majella), Michael (Carol) and Austin (Rosemary); as well as her beloved nieces and nephews, extended family and friends in Canada and Ireland. Predeceased by her mother Emma and father Joe. Deepest sympathy to Seamus and family and sincere condolences to John & Mary, Joe & Majella, Michael, Austin and families on the loss of a beloved Wife, Mum, Sister and Auntie. So sorry to hear of Mary’s passing. Our thoughts and prayers are with you during this sad time. Sorry to hear of Mary’s passing Seamus our thoughts are with your whole family. So sorry to hear about your loss. We knew each other well growing up in Ardbeg. My parents and Marys parents were great friends. Seamus, you and your family are in our thoughts and prayers. My love and condolences to you all. Auntie Mary will always hold a special place in my heart and I have so many memories of her from my childhood. Dear Seamus, I am so sorry Mary passed away. I remember her, when at the Cross Cancer Institute getting radiation. You and your son were there with her. Please accept my condolences.